At 3 months, Bernie began his career as a therapy dog, when he was taken to a pre-school. 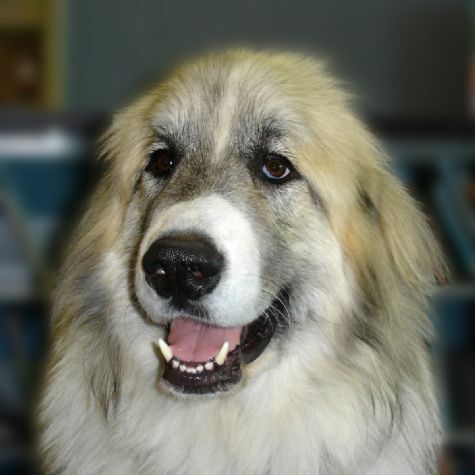 He was named Bernie because the staff thought he was a St. Bernard, but this gentle giant is a Great Pyrenees. Bernie is 36˝ to the shoulders and weighs 135 lbs. His best friends are 2 kittens, who sleep on his bed and try to get his food, but he just licks them. Bernie loves ear rubs, playing with other dogs, and hanging out at sidewalk cafes. He has won awards and the title �AAA Therapy Dog of America�.